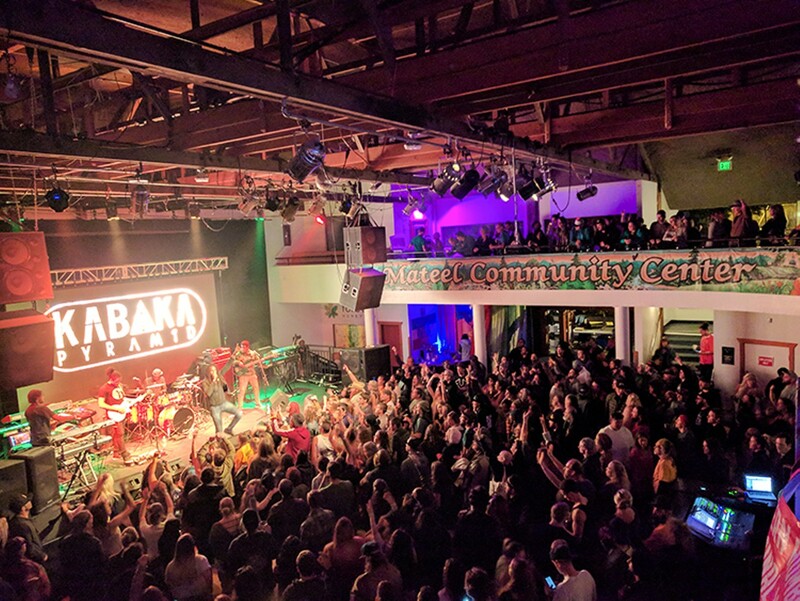 Kabaka Pyramid plays the Mateel. The depths of the Mateel Community Center's financial woes continued to sink in at the January board meeting as newly sworn in members immediately faced a creditor's demand and a discussion of bankruptcy protection options. 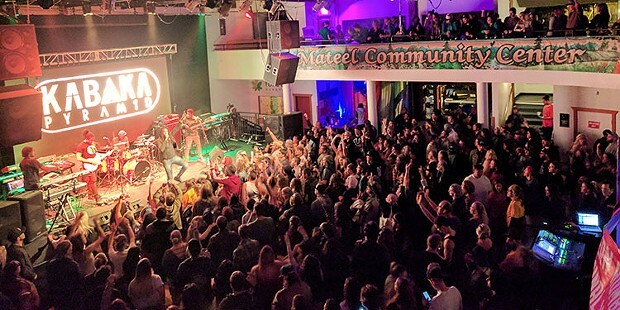 The Mateel's deep financial trouble bubbled into public view last fall when the Southern Humboldt community institution reported it had lost $140,000 on last year's Reggae on the River festival, historically the fundraiser that buoys the nonprofit's budget for the year. The loss resulted in a $430,000 budget deficit, coupled with more than $140,000 in outstanding debt, that has put the 30-year-old nonprofit on the brink of insolvency, prompting it to cut staff back to "essential hours" and reduce services. During the finance committee report at the meeting earlier this month, board President Garth Epling told his fellow board members that an unpaid vendor was about to go after his and the Mateel's assets for a debt stemming from last year's Reggae on the River festival. The Mateel had an unpaid bill of $30,000 with Sysco, a multinational food distribution corporation, plus an additional $10,000 in late penalties and collection fees, as well as potential legal fees associated with the debt. On Jan. 16, Epling received a demand for payment by Jan. 18. If he failed to make good on the Mateel's debt, the demand warned, Sysco would begin legal action to go after the Mateel Community Center's assets and his own, "individually, solely and separately." Epling's liability arises out of a last-minute refrigerated truck rental for Reggae on the River in 2014. The contract Epling signed "on the dusty hood of a truck in the pre-show chaos" contained a promissory note. Although the Mateel completely paid its 2014 bill and closed that contract, Sysco used the promissory note from that truck rental to hold Epling personally liable for bills incurred three years later. Epling, upon receipt of this correspondence, consulted an attorney and learned it was going to take a court fight to remove his personal liability and the Mateel would remain in jeopardy of an asset forfeiture, so he has used $30,000 from a family trust and board members agreed to donate the remaining $10,000 to pay off Sysco and stop further action. As the seriousness of this settled in, board members began entertaining the Mateel's options and opportunities under bankruptcy law as a 501(c)(3) nonprofit. Stephen Helliwell, a financial counselor and newly elected member of the board began giving the board financial advice before he was even officially seated. Helliwell told them 501(c)(3) corporations are eligible for Chapter 11 bankruptcy protection, which allows entities to restructure debt while protecting their assets. However, he warned "most organizations fold before they do that." The board keeps putting one foot in front of the other to keep the Mateel operating. With a sigh of relief, Epling reported the Mateel has money on hand to pay to file its 2015 audit with the California Attorney General's Office of Charitable Trusts and stave off the potential suspension or revocation of its nonprofit status. Before the meeting, the Mateel also received word that the Humboldt Area Foundation had awarded it $5,000 to use for financial planning and consulting. After the meeting adjourned, board member Meghan Gomes said the foundation will help the Mateel set up a meeting with a financial advisor and she hoped that process will move quickly. Regarding Reggae, which the Mateel has previously indicated it will look to sell or lease out, the board reported it is currently in the third round of negotiations with a "partner" for next year's festival. The board offered few details but reported that if a contract is entered, the partner, and not the Mateel Community Center, will be the producer of Reggae on the River 2018. Board member Dusty Hughston said an agreement needs to be reached within three weeks or the show cannot happen. The Mateel is currently planning to hold its annual Summer Arts and Music Festival in June. Business sponsorship for the event has begun coming in and the board envisions a small, local incarnation of the festival, with plenty of community dance troupes, kids' performances and tweener musicians. The board says the focus will return to families and community. The next steps in planning that festival, the board reported, are contacting unpaid vendors to update them on the Mateel's financial situation and determining if payment plans can be developed with them. After those conversations, the board plans to begin a media and publicity campaign. At its Jan. 18 meeting, the board encouraged the fundraising committee to begin an emergency pledge drive for the $40,000 to reimburse the Sysco bill. The committee immediately started the "Garth and Goliath" campaign and Epling began personally reaching out to friends and community members. In addition to an online donation page — www.youcaring.com/helpgarth — the Southern Humboldt Community Credit Union has an account — #13597-54 — set up to field donations. Gomes says that community members, after a bit of a holiday lull, continue to come forward to help with the Mateel's various fundraising campaigns, offering what they can. Nicole Divine has spearheaded an auction of redwood sculptures by Sacco to benefit the nonprofit. The larger-than-life-size sculptures have been on display at the SoHum Art Gallery beneath Cecil's, the Stone Junction in Garberville. Interested people can call 223-5409 to place bids and learn where the carvings go next. 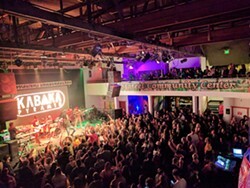 The auction will be completed at the Feb. 14 Matisyahu performance. Bidders can place bids by phone until then. 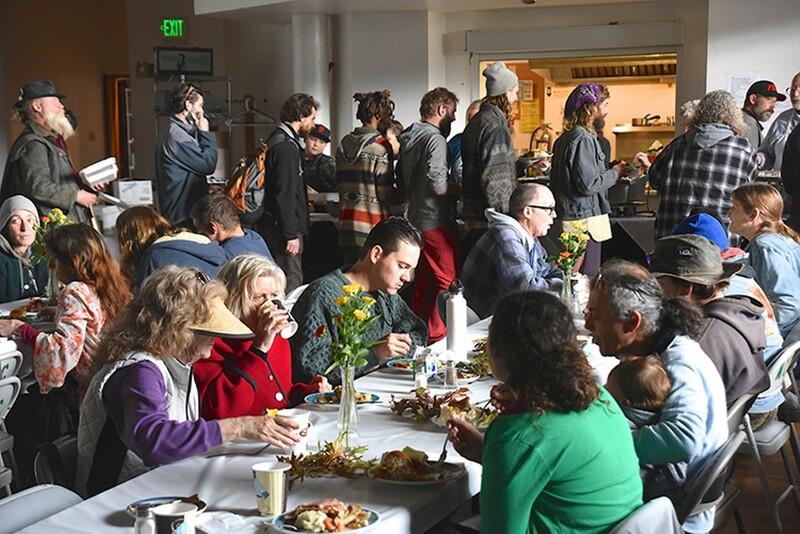 The Mateel Meal, the nonprofit's twice weekly free meal program, was not on the Jan. 18 agenda although when it was suspended as a cost-savings move in the fall, it had been scheduled to return in January. The topic of transparency was on the agenda but the board discussed the need to sign confidentiality agreements under that topic after a board member had allegedly violated one by talking about a potential Reggae partnership. When asked about transparency, the board decided that posting its meeting agendas and minutes on the Mateel website will help the community feel more fully engaged with the center. But the board decided to limit minutes to the actions taken to minimize intrusiveness and "micro-combing of the notes." The meeting was the first for board members who prevailed in last month's elections. In addition to Hughston, who was re-elected, Helliwell and longtime Mateel member Bruce Champie took their seats for the first time. Kelley Lincoln reports for the Redheaded Blackbelt and KMUD News. She has been involved with the Mateel Community Center — volunteering and at festivals — since 2005. A version of this story first appeared on www.kymkemp.com.